That is so pretty and initially I really thought it was icy! I’ve been disappointed not to have any “classic” water lily opportunities this summer, but this was kind of neat. Thanks, Gwennie, glad that you liked it! Great light. Terrific image, Ellen! Thanks, Jane! I was looking forward to trying some classic water lily images this summer but there just aren’t any in the places I’ve expected to see them. Thanks, Belinda! I almost didn’t bother taking the shots they were so far away but it worked out. It really does look like ice. Beautiful! 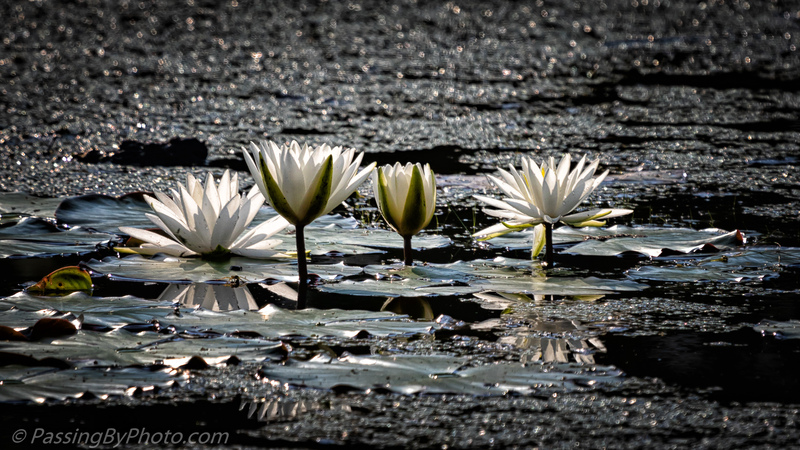 Wonderful how the water reflects the lilies and plays with the light. Thank you, Greta! I would have liked to be closer and try some different angles but there was no other access to this pond. Yes, Liz, that would be fine! Thank you.